Dried pasta twists in a tomato & herb flavour sauce. 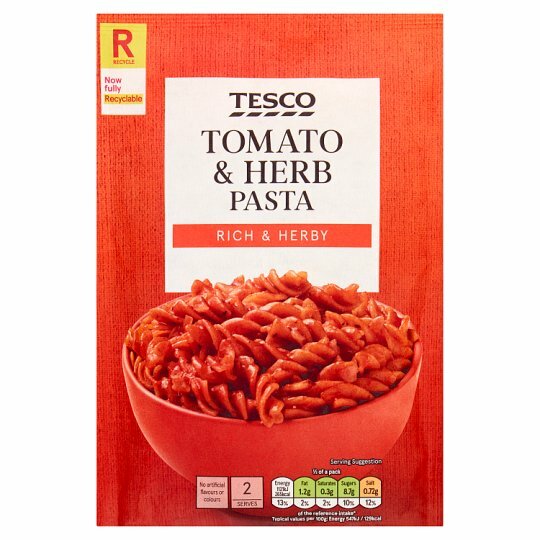 INGREDIENTS: Dried Pasta (71%) (Durum Wheat Semolina), Tomato Powder (11%), Sugar, Maltodextrin, Maize Starch, Onion Powder, Flavourings (contain Wheat), Dried Onion, Garlic Powder, Salt, Dried Herbs, Palm Oil, Colour (Beetroot Red), Ground Black Pepper. Place 400ml of boiling water into a large (3-4 pint) non-metallic bowl. Empty the contents of the sachet into the liquid, stir and cover loosely. Cook on full power 800W/900W for 4 minutes, stir then cook on full power 800W 4 minutes / 900W 3 minutes. Leave to stand for 2 minutes after cooking. Stir before serving. Place 400ml of cold water in a saucepan. Bring to the boil. Stir the contents of the sachet into the liquid. Simmer gently for about 8-10 minutes, stirring occasionally, or until the pasta is tender and the sauce is of the desired consistency. Remove from the heat, stir and serve. The sauce will thicken on standing.